ept’s Colibri high-speed connector is now available as a 16 Gbps and 10 Gbps version. 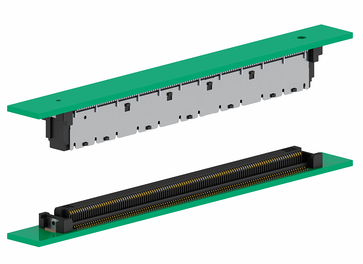 This new board-to-board connector was developed by connector manufacturer ept in response to the ever-increasing market demand for connectors suitable for sophisticated high-speed transmission applications such as USB 3.1 Gen2 and PCI Express 4.0. The Colibri COM-Express boasts a compact design with a 0.5-mm pitch. Like the 10-Gbps version, the new high-speed version is available for a board-to-board distance of five or eight millimeters. Both the plugs and receptacles are available for pin counts of 40, 80, 120, 160, 200, and 220. There also is a 440-pin version, which is made up of two 220-pin plugs or receptacles held together by a soldering frame. The 16 Gbps version is compatible with the Colibri standard version in terms of layout and mating. The Colibri high-speed connectors are ideally suited for all types of applications that require high data transfer rates. This, in particular, includes mezzanine board-to-board systems and COM Express specifications. The small high-speed pro devices are already being used in a wide variety of areas, such as in industrial automation, kiosk and POS systems, medical technology, measurement technology, consumer electronics and gaming, as well as in transportation and building technology. In order to guarantee outstanding signal quality despite high data transfer rates, ept optimized the contact design for the entire Colibri connector series. Samples and S-parameters for simulating data transfer rates of up to 16 Gbps will be available for interested parties at the embedded world 2019 in Nuremberg. The Colibri Plug 16+ will be available as of March.